Some luxury car owners avoid paying London's congestion charge by falsely claiming their vehicles are taxis, a motoring group has claimed. Clean Green Cars has found that 52 Range Rovers, 31 Bentleys and eight Rolls Royce Phantoms are among cars registered as private hire vehicles. This enables them to avoid paying congestion charge, which will increase for high-polluting vehicles in 2008. Transport for London said: "We will thoroughly investigate the allegation." 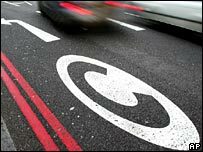 Vehicles entering London's congestion charge zone between 0700 GMT and 1800 GMT on weekdays currently have to pay an £8 fee. This will rise to £25 for high-polluting vehicles, including many luxury cars, from October 2008, if the Mayor of London's proposal for an emissions-related road toll is given the go-ahead. Motoring group Clean Green Cars, which promotes environmentally-friendly car choice and driving, highlighted 10 models of car registered as private hire vehicles with Transport for London (TfL), therefore avoiding the charge. "Some luxury cars are genuinely used as private hire vehicles," a Clean Green Cars spokesman said. "But how could a car with no usable back seat, such as the Jaguar XK and a BMW 6 Series, possibly be used as a minicab?" He added: "A lot of these cars are clearly high-polluting vehicles, which will incur much higher congestion charges from 2008. "There is now a big financial incentive for drivers to falsely register as private hire cars." Clean Green Cars said TfL should only enable low-polluting cars with at least four doors to register as private hire vehicles. A TfL spokeswoman said "fairly few" luxury cars were registered as private hire vehicles. She said the Public Carriage Office and congestion charging unit made regular checks on licensed vehicles to "ensure they are being used for the purposes for which they were licensed". She added: "The allegations raised will be thoroughly investigated and if any vehicles licensed for private hire are found not to be being used as such then their licenses will be revoked immediately."